A wide range of cases for Samsung Galaxy S8 Plus is available in the market for the protection of your smartphones. To ensure the protection of their Galaxy S8 Plus, we have prepared a hand-picked list of the best Samsung Galaxy S8 Plus Wallet Cases. Samsung Galaxy S8 Plus is a smartphone with a large 6’2’’ inches display screen which enables you to enjoy viewing movies, streaming videos or surfing the browser at an enlarged view. The front of this smartphone is just the screen. Hence it becomes a dire necessity to protect your phone from the daily wear and tear use. Samsung Galaxy S8 Plus Wallet Cases can be used for multiple functions such as storing your important cards or keeping your cash safe along with your phone. We have already covered some of the best Galaxy S8 Plus Cases and best Galaxy S8 Plus Screen Protectors for providing you more options to choose from for your phone’s safety. Here, we have listed some of the best Galaxy S8 Plus Wallet Cases for the ultimate protection of your Samsung Galaxy S8 Plus smartphone. Samsung is considered to be one of the well-known brands for the wallet cases. It has launched the Galaxy S8 Plus LED View Wallet Case in the market which is mesmerizing a number of buyers with its extraordinary features. 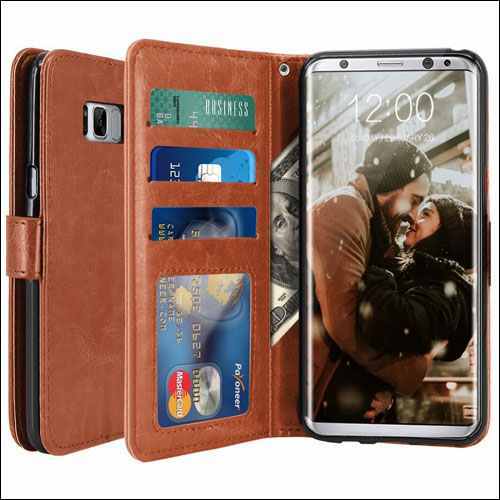 This wallet case with a simple design provides you the facility to view the notifications of messages, updates, alarms, incoming calls, and other apps on the front of the cover with its LED indicator. This case is capable of responding to your incoming calls just by swiping the cover. You can even designate the LED caller ID icons to know who is calling you. Looking for a leather case? Spigen brings you one of the best leather wallet case for your device. This wallet case is made up from premium quality of synthetic leather. Embedded with a TPU case, this wallet case keeps your phone free from external impacts. Moreover, the screen remains free from fingerprints and scratches due to the soft interior of the case. The cardholder slots provided enables you to store up to 3 cards – be it your credit cards, debit cards, or ID cards. The additional space provided can keep your cash safe. This wallet case with a magnetic strap keeps your phone safe in a closed state. You can tuck this strap at the back and enable the kickstand feature for a hands-free viewing of videos and movies. Designed with dual layer protection, this wallet case provides maximum protection to your Samsung Galaxy S8 Plus phone. This dual layer consists of a TPU (thermoplastic polyurethane) case and a tough PC back. This wallet case is military-grade certified case constructed with Air Cushion technology in all the corners of the case. This technology protects the phone from bumps and drops. Just slide the card holder slot at the back and securely store maximum 2 cards without the fear of losing your cards. The precise cutouts for the buttons and ports help you to easily access the functionalities of your phone. Among the best Flip Cases, Belk offers you a hard PC case with a kickstand feature. This feature gives you the pleasure of viewing videos or surfing the browser keeping your hands free. Made from supreme quality of leather, this flip wallet case is slim and light in weight. Textured with durable microfiber, this wallet case with a retro and vintage look gives your phone an elegant appeal. The built-in pockets in the interior of the case help you to store your cards and cash safely without adding any bulk to the phone. The fully wrapped hard plastic inner back wraps all the contours of your Samsung Galaxy S8 Plus. The precise laser cutouts allow full access to all the buttons, ports, camera and speakers of your device. The Strada Series from Otterbox is made from premium quality of leather which gives your phone a stylish look. The case is soft to touch and offers maximum protection to your phone. The slim design of this wallet case enables you to easily slip in and slip out the phone from your pocket. The interior of this case is designed with ultra-protection to prevent your screen from scratches and grimes. The vertical slot in the case is capable of storing your cards or cash. Moreover, the magnetic clasp ensures the security of your phone in open and closed states. Maxboost has designed the Folio Case which is compatible only with your Galaxy S8 Plus phone. With an array of cardholder slots in the interior of this folio case, you can keep up to 3 cards in a perfectly organized manner. A side pocket provides you the facility to keep your cash or other additional cards in it. The magnetic lock design ensures the safety of your device. Made from premium quality of leather, this case offers you a variety of color options to choose from ensuring the all-round protection of your phone. The exact cutouts at the camera, ports, and speakers allow easy access to the phone. You can keep this case in a horizontal position to enjoy hands-free viewing of movies or while using video-calling applications. You get a lifetime warranty from Maxboost on the purchase of this leather flip cover. The 2-in-1 detachable wallet case from JGOO is the best choice for using your phone case in multiple ways. You can store up to 2 cards in the card slot holder in the interior of the case. 1 transparent slot is provided for the storage of your photo. In addition to this, 2 card slots are provided at the back of the case for storage of extra cards. The strong magnet provided in the case holds back your phone from falling down. This wallet case with precise cutouts is the perfect fit for your Samsung Galaxy S8 Plus phone. The Samsung Galaxy S8 Plus Leather Wallet Case from Lumion is designed exclusively for your Galaxy S8 Plus phone. Keeping your daily travels into consideration, this wallet case with a slim profile is light in weight. The interior and exterior of this case are covered with synthetic leather to provide a seamless look and feel to your phone. The trendy and designer magnetic strap offers ultimate protection to your phone from bumps and drops. The exact cutouts at the speaker and camera allow easy access to the functionalities of your phone. The inbuilt card holder slots allow you to store up to 3 cards. An additional sleeve in the case helps you to store your bills in the case. The Samsung Galaxy S8 Plus Flip Case is designed with a hands-free design so that you can enjoy viewing movies, streaming videos or surfing the browser by using the kickstand feature. Made from high quality of soft TPU material, this case is capable of absorbing shocks and also provides protection to all the four corners. The multiple card slots allow you to carry up to 3 cards in your wallet case. The additional pocket helps to keep some of your cash safe with you. This wallet case with a user-friendly design is the perfect fit for your Samsung Galaxy S8 Plus phone. You can use this multi-functional case as a portable wallet as well as a case. This classic leather wallet case made from genuine Italian leather provides luxury to your Samsung Galaxy S8 Plus phone. With excellent stitches and handmade designs, the vintage look of this case enhances the class of your phone. The kickstand feature for entertainment allows you to view movies and videos from multiple angles. The cardholder slots enable you to store up to 3 cards and the money pocket is provided to securely place your cash. With a long-lasting durability, this case is simple yet elegant. You get the advantage of lifetime warranty when you purchase this wallet case from iPulse. Which one of the above listed best Samsung Galaxy S8 Plus Wallet Cases would you like to have for your smartphone? Do write about your choices to us in the comments section.